Salt is more than just a condiment. Amazingly, salt can be used in a hundred different ways. The cleaning benefits of salt are just too many to mention it would probably take a whole book to cover everything. However, here are some of the most popular ways to use salt for non-cooking purposes. Of all its many uses, salt as a cleaner is perhaps the most popular and versatile of all. Salt can be used to clean unsightly marks caused by water mineral deposits in aquariums and flower vase. Just sprinkle salt on the mineral deposits to loosen it. Wash afterwards with plain, soapy water. Salt is also effective in removing tarnish in copper and brass items. To remove those green stains from your precious copper or brass belongings, mix salt, vinegar and flour in equal parts. Use this paste to clean and shine your tarnished wares. Use a soft cloth for better application. Salt also works as a dry cleaner. For instance, it can be used to clean nylon or silk flowers. Just put the flowers inside a paper bag filled with a quarter cup of salt and shake gently. For flat iron with a stained or dirty metal soleplate, you can clean it by sprinkling salt in a newspaper. Run the hot iron over it to remove any rough deposits in the soleplate. Salt is also a good kitchen cleaner. For those blobs from spill overs on stove, sprinkle some salt before it hardens and dry to make it easier to wipe later on. Teapots and cups can be stained with coffee or tea. To remove those unsightly stains, just sprinkle a little salt on the stained area and rub with a sponge in a circular motion. For those stubborn stains, you can leave the salt overnight before wiping. Another option is the mix salt with vinegar and wipe over the stain using a sponge or cloth. Watermarks can also be removed from glassware by mixing a quart of vinegar with a handful of salt. Soak your glassware overnight. Those stubborn marks will be wiped off easily in the morning. Stubborn lipstick stains in glassware can also be easily removed by rubbing salt on the area. Enamel pots and pans with burned on stains can be quite unsightly. To remove them, pour salt water or boil salt water in the pot or pan. This holds true with burned milk as well. Sprinkle some salt, let it stay for about 10 minutes and then scrub off. Cast iron pots and pans with white molds growing in them or rust can be cleaned with salt and a scouring pad or brush. Just scrub when it is still hot after cooking. Wipe clean and re-season with grease or oil before storing it. Yellow armpit stains on shirt can be effectively removed with four tablespoons of salt dissolved in a liter of hot water. Dip a sponge in the mixture and wipe the stain until it lightens and disappears. 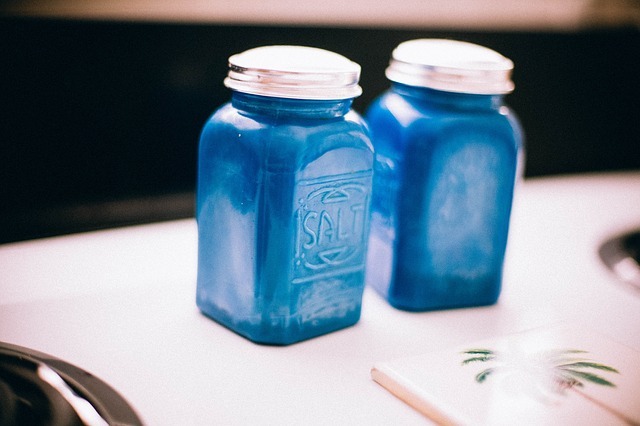 Keeping a big jar of salt at home can save you lots of money from buying household cleaners, stain removers, garden chemicals and personal hygiene products. Who knew life can be so much simple with just a jar of salt at home?